Only three stories in this one, but they were remarkable: the first two, The Body-Snatcher and The Merry Men, are both ghost stories, of a sort; certainly atmospheric and creepy, and with extremely dark endings. The third, The Bottle-Imp, isn’t as dark overall, as there is romance to leaven the creepiness — but since it’s about hell and damnation, it ain’t exactly The Poky Little Puppy. The Body-Snatcher is about two men who purchase cadavers for use in medical school; Stevenson connects his characters directly to Edmund Burke, the famous murderer (whose method actually became eponymous, and which I found out about it when one of my Honors students brought this to the class: to burke [burked; burking] is to murder someone by sitting on their chest so that they cannot breathe, thereby creating an appearance of a non-violent death and making it easier to sell the cadaver) who sold his victims’ bodies for dissection. And I can’t help but wonder how someone could think that was a reasonable way to come into money. I mean, “reasonable” is of course relative; we’re talking about murderers, here. But how much did they make off the medical schools? This isn’t the mafia selling contracts on their enemies and paying accordingly; colleges and universities can barely pay their staff. How much was a body worth, $50 in the equivalent amounts for the time? $100? I can’t believe people murder for that little. Now, if you have another reason to murder – if you’re a knee breaker for a bookie, say, and someone owes too much and you cancel their account; I can see bringing the corpse to the medical school as a way of disposing of the body you’ve already got, and hey, $50 for your trouble? Good deal. That makes more sense to me. It makes more sense to the men in the story, too. Stevenson explores all of the alternatives: they buy bodies from murderers; they go out and rob graves themselves; they become complicit in covering up a murder when one of the two main characters recognizes the new corpse produced and turned in by the Burke-character; and then, finally, one of them commits a murder and sells the body for dissection in order to cover it up. Ah, for the halcyon days when nobody needed a death certificate! Stevenson turns the story rather suddenly at the end, though – a trick which he repeats in The Merry Men, and to some extent in the last story, The Bottle-Imp. The two corpse-buyers go out on an acquisition mission and suddenly find themselves in a ghost story: but only in the very last sentence of the story. That’s it: it ends with the unexpected appearance of the specter. It’s interesting; I don’t see a lot of stories that have a climax in the last sentence: and in this book there are almost three of them. But the best thing about The Body-Snatcher? The alternate job title for grave-robbers who provide dissection cadavers: Resurrection Men. I cannot imagine why he didn’t use that for the title. If I ever write about grave robbers, you bet your sweet bippy I’ll call it that. The second story is even more atmospheric than the first; the melancholy mood is not created by the actions of the characters, but by the environment. 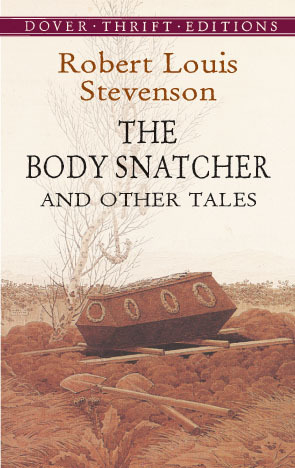 Stevenson, impressively, loses nothing in the change: he is as good at making the coast of Scotland creepy as he is at showing how creepy body-snatchers are. The Merry Men are not men, they are actually waves that crest and crash near the farm that is the setting for the story; Stevenson describes how the waves, which appear on stormy nights and pose a serious and deadly danger to any ship caught amongst them, seem to be laughing and shouting as they smash into each other and pummel the rocky shore. That is just chilling, and it and the rest of the shoreline and the surrrounding area are beautifully described in the story. The story concerns a series of shipwrecks along this shore: one back when the Spanish Armada tried to invade England and was scattered by a storm; one a few months before the story takes place; and the last during the story. In the process, the owner of the farm close by Shipwreck Central loses his mind entirely, despite the best efforts of his daughter and nephew, the other main characters. I loved the descriptions of this, pretty much every one of them, but especially when the narrator goes diving for the Spanish shipwreck and explores the bottom of the lagoon; and also the final sequences of storm and madness. The action and tension are good, too, though I had one problem with the downward spiral of the farmer’s mental state: he commits a murder seemingly without reason or provocation, which is not too far out there – except that it happens at the beginning of his losing his mind, not at the end. It doesn’t happen in the story, and we never hear the farmer’s side, which is too bad; I wanted to know why. Otherwise, I loved this one, even the sudden and ghastly ending sentence, even bleaker than the first story’s final words. The third story, though: that one was tougher. I loved the concept and the setting: it actually happens in Hawaii, where Stevenson (I didn’t know this) spent the last years of his life, and the story concerns a young man who receives a magic bottle. In the bottle is an imp, an imp that will grant any wish to the bottle’s owner. The catch, however, is that if the bottle’s owner dies while the bottle is in his possession, he will spend eternity in Hell. So of course, the thing to do is get the bottle, make your wishes, and then get rid of it before you die. But here’s the second catch: the bottle must be bought, and it must be sold at a loss. So if I bought it for $100, I’d have to sell it for no more than $99. Or presumably, $99.99. Getting past those issues, I liked the story. The young man gets the bottle, wishes for a beautiful house and then gets it; then he gets rid of the bottle – and then he falls in love. And then he finds that he has leprosy. And so he has to get the bottle back – paying less for it than he sold it for, of course. The story goes downhill from there. It was romantic and sweet, and I would have done what these two people do. And this one also had a surprise ending: which I won’t ruin. Surprisingly, this review has gone on almost longer than the book, which is well under 100 pages. But they were good stories, and that inspires me. I would recommend pretty much anything by Robert Louis Stevenson, including this book.